(ThyBlackMan.com) Most persons interested in the politico-economic ascension of Black America agree that the only reasonable path forward flows from a relevant education that generates a heretofore elusive like-mindedness on political, social, economic, and cultural matters. Collectivism is supremely important to an African-American populace that is certainly not monolithic. The African-American historical record is filled with intra-racial discord that highlights significant disagreement regarding even the most basic elements of liberation such as goals. The historical record of any people that have successfully escaped the shackle of tyrannical oppression displays that group uplift follows solidarity of thought. Despite what many may wish for young black males in particular, and the race in general, solidarity of thought is manufactured via educational institutions and social, economic, political, and cultural mandates/expectations. Consider for a moment that it is not accidental that the vast majority of students who emerge from the University of Notre Dame are pro-life as the school’s curriculum shapes their thinking in that regard. Nor is it accidental that the foremost issue on the agenda of Jews is the protection and sovereignty of Israel; every portion of that community’s socialization process is aimed at impressing upon succeeding generations that until Israel is free, they will never be free. A similar teaching was advanced by the great historian John Henrik Clarke who admonished persons of African descent strewn throughout the West that “until Africa is free, you will never be free.” Unfortunately for persons of African descent, such teachings have failed to take hold as we have yet to develop an educational mechanism that convinces the masses of our people that such a worldview is the only reality worth fighting for. Anyone interested in improving the lives of black males must realize that their ability to manufacture consent is crucial to that endeavor. Although many may disagree with “the manufacturing of consent” via educational institutions, the truth is that there are no more efficient means of generating collectivism than controlling what is and what is not taught in school houses. 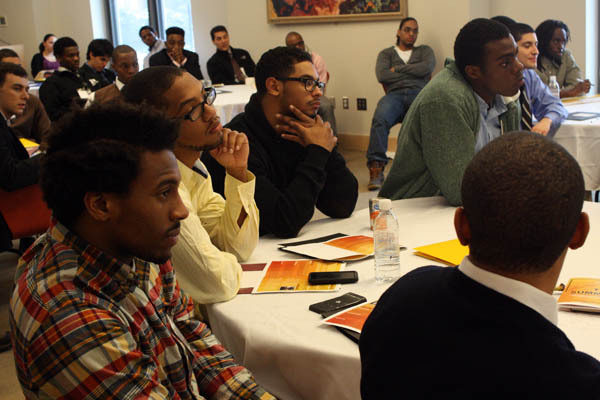 Put simply, there is no more efficient means of guaranteeing a reversal of the dire predicament of young black males entrapped by a non-reflective educational system than reversing the indoctrination that has flowed from an irrelevant curriculum that has done little more than busy their mental processes with items that have nothing to do with their ascension. This is a critical moment for the fortunes of black males as it is imperative that black educators take Malcolm X’s earlier assertion to heart and turn inward and create independent “freedom schools” that provide a relevant curriculum for African-American boys and girls. Black America must become extremely serious about taking ownership of its present plight, a crucial aspect of that process is finally accepting that no one is coming to help you in this endeavor, let alone to save you from a familiar misery. We must busy ourselves developing independent educational institutions that not only inform our people of their last place status in every social, health, economic, and political indicator but also work to scientifically address these issues.